"I've seen quite a few, mostly good opticians but Jane was way ahead of anyone I'd seen previously. So when she moved to Williams from her previous practice, so did I." "My whole family have been to Williams for several years. The service is excellent and the advice given is very knowledgable. We like to support local business whenever we can!" "The whole process was quick and efficient, on top of a very professional service. Thank you!" "I have been a customer of S.J. 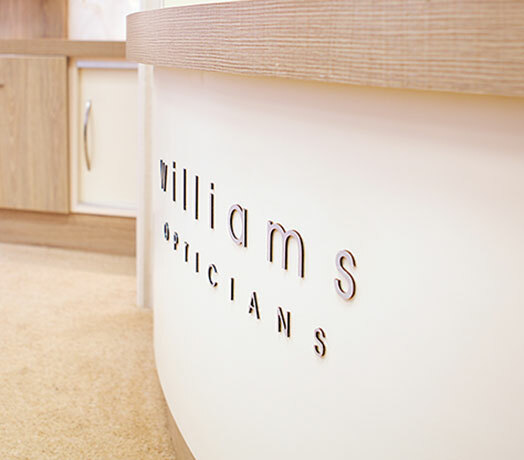 Williams for many years and have always been satisfied with their service. In the last few months I developed complications following a cataract operation which necessitated multiple eye examinations until the eye sight finally stabilised. During this time I received exceptional care and service." "Visiting this optician is always a pleasant thing to do and the transformation of layout in the reception area is greatly improved. The large photo of the old building is quite stunning and a real eye catcher."